This repository contains lightweight, very quick and easy to use Profiler with adapter for Tracy. If you wish to profile a block of code, simply encapsulate it between Profiler::start and Profiler::finish calls. If you wish to know more about Profiler, please visit Profiler's README.md. 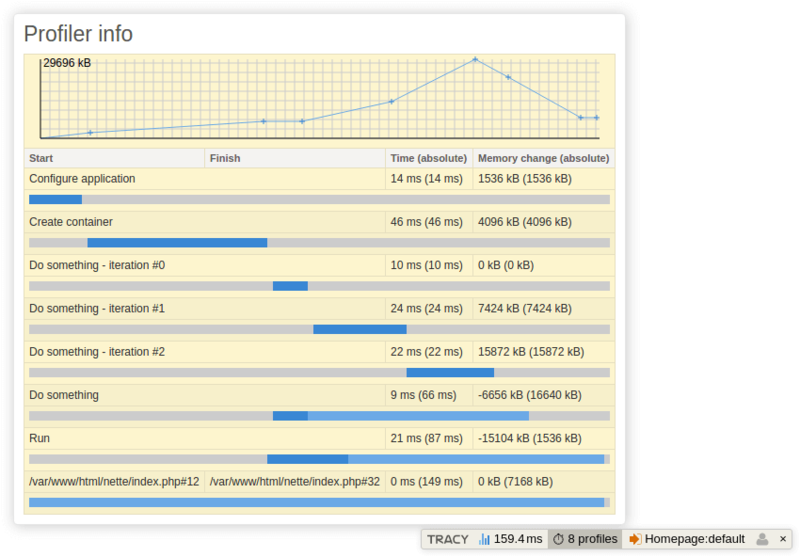 Run composer require netpromotion/profiler in your project directory. Add extension Netpromotion\Profiler\Extension\ProfilerNetteExtension into your configuration, it is not necessary to call Profiler::enable. If you wish to profile before the container is ready, call Profiler::enable manually. There is a live demo available - run make demo and click here. Add panel Netpromotion\Profiler\Adapter\TracyBarAdapter to your bar via Bar::addPanel method manually or use netpromotion/tracy-wrapper. "primaryValue" => "effective", // or "absolute"